You are here: Home / Best Practice / Does Your Elevator Speech Go to the Top Floor? 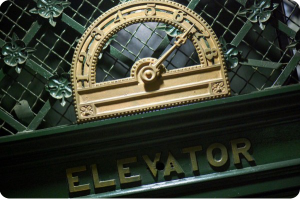 Does Your Elevator Speech Go to the Top Floor? In today's job market, there's no doubt that one of the most helpful tools career professionals need is a powerful, effective elevator speech. Yet, it's a hard skill to master. I've watched seasoned executives fumble and break out in sweat because they were asked to share their elevator speech and weren't prepared to respond. I've attended quite a few networking meetings. Some require you to present your elevator speech in 45 seconds or less. There's usually a timekeeper tracking your performance. When you hit 45 seconds, s/he politely begins clapping which triggers the audience to join in applause. When that happens, you know it's time for you to shut up and sit down. If you haven't gotten your message out...well, that's just too bad! An elevator speech or pitch is a short and effective means of verbally communicating your value or motive to another person to attract them to want to learn more about you. It's called an elevator speech because it should take no longer than the time required to step into an elevator and ride up a few floors. It should be between 30 and 60 seconds long—no more! That's about 50 to 90 words maximum. That's not a lot of time and very few words to tell your story. Of course, if you are five time world record holder Fran Capo, listed in the Guinness Book of World Records as the fastest talking female, clocked at 603.32 words per minute (wpm), it's a piece of cake. Now her's would be an interesting elevator pitch! Good morning. I'm Victor Font. I'm an IT executive who maximizes IT's business value. I've worked for AT&T, JP Morgan, Pfizer, CARQUEST and lessor known firms in many industries. I've authored and published The Ultimate Guide to the SDLC and am a foremost authority on the system development life cycle. Step 3: Your approach will be different here depending on whether your audience is a decision maker or job seeker. Create both versions and practice them. What keeps you up at night when you think about IT? I'm seeking introductions at Google and Amazon. Do you know anyone there? Step 4: Make your closing statement, offer your business card, repeat your name, spelling it if necessary, and tell your audience where they can learn more about you. As in Step 3, what you say will differ depending on to whom you are speaking. Let's talk about those challenges and how I can help solve those problems. My name is Victor Font, spelled F-o-n-t, and you can find me on LinkedIn or victorfont.com. Let me know how I can help. I have contacts at your target company. My name is Victor Font, spelled F-o-n-t, and you can find me on LinkedIn. Both of these elevator speeches are exactly 90 words. Use them as guides to write your own, then read Nailing Your Elevator Speech Delivery to polish the skill.